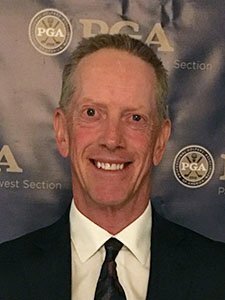 This month we interview Bob Duncan, winner of the 2018 PNWPGA Deacon Palmer Award, which is awarded for outstanding performance in the face of a personal challenge. Since diagnosed with Parkinson’s disease almost four years ago, Bob is continuing his busy and successful teaching career, including developing the Golfer Positional System and representing Directed Force Putters. My father got me into golf, and when I started working in 1976 in the bag room at Chenequa Country Club in Hartland, Wisconsin, I knew that I wanted to be on the golf course as much as I could. The PGA seemed to be the best way for me to do that. I saw the respect that players had for the pro there, and I thought it would be great to be on the golf course every day. My first job there was working 40 hours a week in 3 1/2 days. That’s probably illegal now, but that’s how we did it. Then I had 3 1/2 days a week to play golf. Worked out well for me! Can you tell us a little bit about Golfer Positional System? The Golfer Positioning System positions Players for success by coaching them to play golf on the golf course. Over the first 15 years of teaching I found the old “model swing” teaching model didn’t teach Players how to play, because it never went on the course with them. It taught them to swing, but not to play. G P S coaches Players to play with the golf course and not against it. Instead of allowing the Player to try any shot he wants to play, G P S presents the on-course variables to the Player in different yet predictable values. The Player estimates the influence of each, and makes decisions about how to play and use the variables to the Player’s advantage. I made the decision to try to work with the conditions rather than fight them, resulting in a 20% increase in proximity to the hole with attention to just one of the variables. This is what I call effective and predictable results, vs swing model theory. I decided to put this variable into a phone app, called the G P S Launch Pro, currently available in the Apple App Store. I am very humbled that the Chapter and Section have considered me for the Deacon Palmer award. Arnold was my father’s favorite Player, and though I didn’t get to see Arnold play much, I appreciated his play of the game when I read books on the tour years later. Arnold was a professional athlete, and a showman but with a gentleman’s attitude and demeanor. Deacon’s road was surely rocky, but his is a story of true perseverance. I truly appreciate the recognition of the award linked to Deacon and Arnold Palmer.